The 2-1 Point Convertible QD Sling Adapter turns any standard 2 point sling with QD attachment points into a convertible, true, 2 point to single point sling. 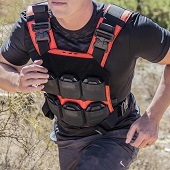 The ability to go from a 2 point to a single point sling increases versatility, particularly while wearing a plate carrier and body armor. Attaching via the built in Tri-Glide, the 2-1 Point Convertible QD Sling Adapter can be installed for right or left handed use, at any point along the sling. Single piece constructed results in a durable and strong mounting point. Compatible with 1.25" webbing and most slings on the market.